"Elisha died and was buried. Now Moabite raiders used to enter the country every spring. 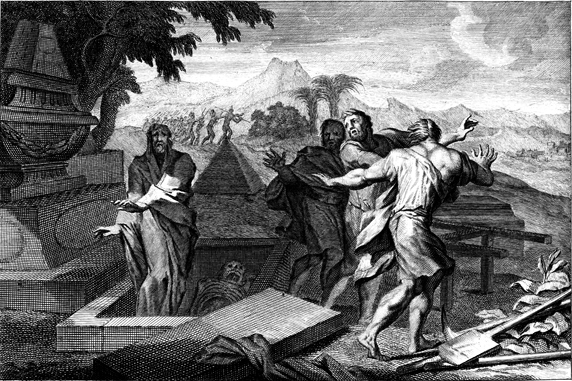 Once while some Israelites were burying a man, suddenly they saw a band of raiders; so they threw the man’s body into Elisha’s tomb. When the body touched Elisha’s bones, the man came to life and stood up on his feet." Thus, while Elisha worked many wonders and miracles, including the resurrection of the dead, in life, the same he also did through the grace of God after death by means of his relics. "Turning away thence Paula saw the tombs of the twelve patriarchs, and Samaria which in honor of Augustus Herod renamed Augusta or in Greek Sebaste. There lie the prophets Elisha and Obadiah and John the Baptist, than whom there is not a greater among those that are born of women (Lk. 7:28). And here she was filled with terror by the marvels she beheld; for she saw demons screaming under different tortures before the tombs of the saints, and men howling like wolves, baying like dogs, roaring like lions, hissing like serpents and bellowing like bulls. They twisted their heads and bent them backwards until they touched the ground; women too were suspended head downward and their clothes did not fall off. Paula pitied them all, and shedding tears over them prayed Christ to have mercy on them." Emperor Julian the Apostate (361–363) gave orders to burn the relics of the prophets Elisha, Obadiah and John the Baptist, who were buried next to each other in Sebaste, but they were rescued by the Christians, and soon after were transferred to Alexandria. In Alexandria, Patriarch Theophilos (384-412) built a "massive" and "much decorated" shrine to house the relics of these prophets. He used the monies to build this by taking it from the treasuries of the temples of Serapis in Alexandria and Canopus. It was established as a means to replace the influence of these ancient pagan shrines. Because of his association with the healing of leprosy, Elisha's relics were housed in the Monastery of Paul the Leper in Alexandria. 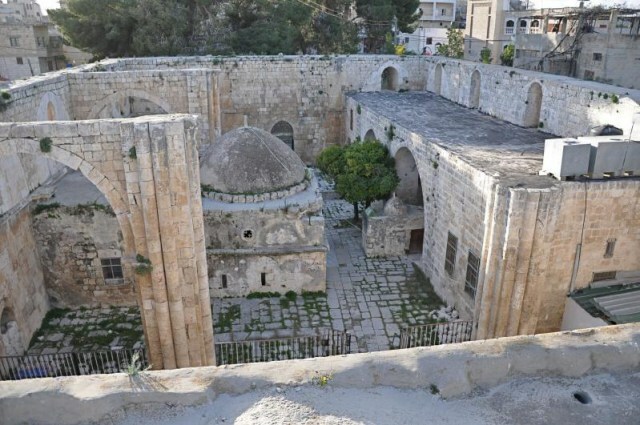 The Church of Saint John the Baptist in Sebaste, built over the crypt that contained the tombs and relics of the Prophets Elisha, Obadiah and John. Towards the end of the reign of Emperor Constantine VII Porphyrogennetos (913-959), the relics of the Prophet Elisha were transferred to Constantinople, and together with the relics of the Apostles Luke, Thomas and Andrew, as well as the Martyr Lazarus, it was placed in the Church of the Holy Apostles. This placement is celebrated by the Church on June 20th. In Constantinople the memory of the Prophet Elisha was celebrated with that of the Prophet Elijah on July 20th, and a church honored both together in the City. The probable reason we celebrate the Prophet Elijah on July 20th is because this was the day on which the relics of the Prophet Elisha were either translated to Constantinople or placed in the Church of the Holy Apostles, where also the Prophet Elijah was celebrated. When these two Prophets were separated in their commemoration, Elijah was celebrated on July 20th, while the placement of the relics of Elisha in the Church of the Holy Apostles was moved back a month to June 20th. The relics of the Prophet Elisha are said to have been carried to Ravenna in 718 and placed in the Church of Saint Lawrence, in the very ancient chapel (of the year 425) of Saints Gervase and Protase. In 1603 the church was destroyed, and nothing is known of the fate of the aforesaid relics. In the Church of Saint Apollinaris Nuovo in Ravenna the head of Elisha is shown to the faithful. Today, the relics of Elisha are claimed to be among the possessions of the Coptic Monastery of Saint Macarius the Great in Scetes, Egypt. The apparent contradiction of the various locations of these relics at different times can be explained when we consider the fact that what we are speaking of here are only portions of the relic of the Prophet.